Oliver Jarvis claimed a first pole position for the Mazda Daytona Prototype international in qualifying for this weekend’s Daytona 24 Hours. The Briton set a 1m33.685s aboard the Joest-run #77 Mazda RT24-P in the middle of the 15-minute qualifying session for the opening round of the IMSA Sportscar Championship. Ricky Taylor got closest aboard the best of the Penske Acura ARX-05s, ending up on a 1m33.873s. Jarvis’s time was the fastest ever sportscar lap around the Daytona International Speedway, eclipsing the 1m33.875s record set by PJ Jones in an Eagle-Toyota MkIII in 1993. “Most important was to be on the pole, but to get the record for Mazda was special and the icing on the cake because everyone has worked so hard in the off-season,” said Jarvis. Juan Pablo Montoya was third fastest in the second of the Acuras on a 1m34.095s, which put him just over a tenth up on the second Mazda qualified by Jonathan Bomarito. The Cadillac DPi-V.R, winner of the past two editions of the Daytona sportscar classic, filled out positions five through nine. Reigning IMSA champion Felipe Nasr took fifth place on a 1m34.433s, which left him more than seven tenths off the pace. The Wayne Taylor Racing Cadillac that Fernando Alonso is racing took sixth place in the hands of Jordan Taylor. Fastest in the LMP2 class was James Allen, whose 1m35.904 put his DragonSpeed ORECA-Gibson 07 10th in the times. Nick Tandy claimed the GT Le Mans pole for Porsche with a new class record of 1m42.257s aboard his CORE Autosport-run factory 911 RSR. Jan Magnussen improved to second at the end of the session with a 1m42.583s aboard his Chevrolet Corvette C7.R, which just edged out Ryan Briscoe’s 1m42.634s in the best of the Ganassi Ford GTs. Davide Rigon was fourth fastest for the Risi Competizione Ferrari 488 GTE on 1m42.712s. The two Rahal BMW M8 GTEs were seventh and eighth, with John Edwards and Connor de Phillippi separated by just three hundredths. 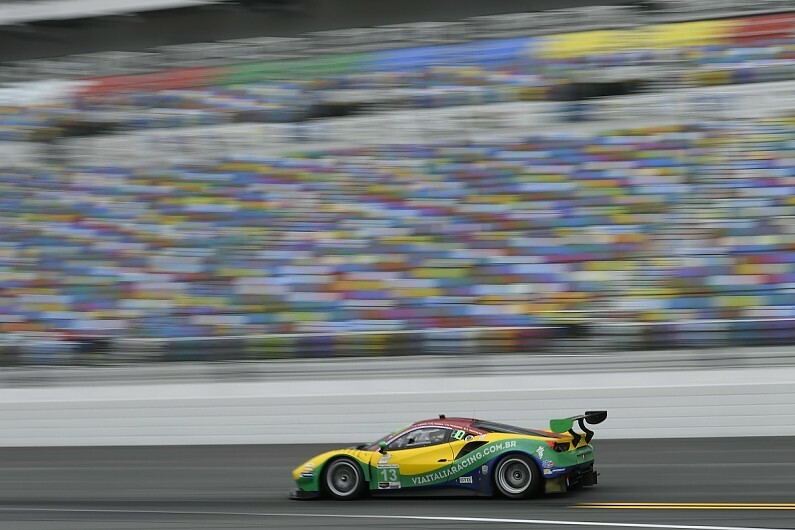 Marcos Gomes, the 2015 Brazilian Stock Car champion, topped the times in GT Daytona for the Brazilian Via Italia Ferrari team. His 1m45.257s in his 488 GT3 put him less than a tenth up on Ben Keating in the Riley Motorsports Mercedes-AMG GT3.